Please send your opinions/stories to me at jd@StampNewsNow.com — along with your suggestions for other subjects. April's (from the April Issue of Stamp News Online) “Yesterday in Stamps” feature presented a 1951 article on Gimbel’s Stamp Department in New York City. Do you have any personal remembrances of Gimbel’s New York Stamp Department? How about one of the other Minkus or other stamp departments at other department stores? Or a local stamp shop? Please share those remembrances and experiences with us—in this month’s Opinions section. 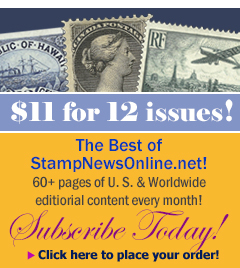 Do you agree with the author of this month’s Yesterday in Stamps feature that Collecting Covers has been a contributor to the welfare and future of the hobby since 1940? And do you feel it will be in the future? And on a related point, how do you feel about his statement, “Philately must depend for its future, for the maintenance of present values, and for the increases desired in market valuation of philatelic items….”? Do we need value increases to popularlize the hobby?